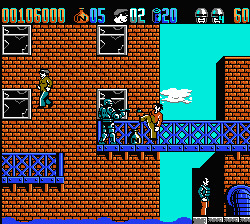 Robocop 2 is an action game that's based on the hit 1990 movie. Your mission is to locate a chemical factory, destroy all the Nuke and eliminate the powerful crime baron Cain. Attack-wise, you can use punches, as well as guns that fire in T-Shot and 3-Way patterns, and unlike the original NES game (1989), Robocop can jump to avoid incoming bullets. The game's 14 levels require you to meet certain criteria (such as arresting 60% of the bad guys, or destroying 60% of the Nuke), otherwise you'll have to complete a Shooting Range mini-game in order to replay the mission. Things get off to a terrible start due to the hideous controls that make Robocop feel like he's skating on ice; it's a huge issue and many lives will be lost due to either slipping off a platform edge, or running into an enemy. Adjusting your flight in mid-air is a stressful experience too, as under/over-shooting your intended target is the usual occurrence rather than precision platforming. Sometimes your inputs are completely ignored too, and while you can duck, it's almost useless as enemy bullets will still hit you in the face! To add to the multitude of issues, the collision detection is appalling and it's possible to die by falling straight through the middle of a platform. Unlike classic NES titles such as Super Mario Bros. (1985, NES), this game doesn't teach you anything about its hazards and traps prior to you falling victim to them; this leads to a severe case of trial-and-error where you'll suddenly be stomped by a giant press, or killed by a seemingly innocuous moving platform. It's unintuitive, as is not knowing whether a platform can actually be jumped on without you committing suicide! Robocop 2 has barely any redeeming features and it constantly feels like you're fighting against the game at every turn. The poor level design and shoddy coding are bad enough, but there's no excuse for the godawful controls that put a stranglehold on the entire experience and cause no-end of frustration. Random trivia: The game features a hidden level select that can be accessed by pressing certain button combinations on the title screen.